Magneto back where he belongs! After fooling the X-Men into thinking that he was a mutant named Xorn he unleashes a surprise attack on Xavier that...succeedes! While as Xorn the X-Men put him in charge of what was basically mutants so low that not even the X-Men really wanted them but Magneto got them to believe him and follow him to aid in the surprise attack, also Toad joins in the fun because he loves Magneto and is the second in command. Later the new Brotherhood attacked New York and...succeeded! 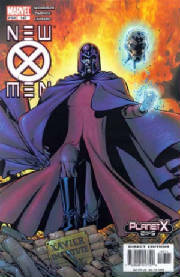 Once in control of New York a druged up Magneto makes life hell for humans and his own Brotherhood. He kills Basilisk with the snap of his fingers and scares everyone including himself. The X-Men return from space though and end the Brotherhood winning streak and chop off Magneto's head. Special Note: Revisionist at Marvel have said that it was really Xorn who pretended to be Magneto that lead the Brotherhood and seeing how it has become accepted and written into various storylines I have no choice to accept however grundgingly I accept it. Also the Angel in this Brotherhood is in no way related to the X-Men's Angel, they just have the same name.